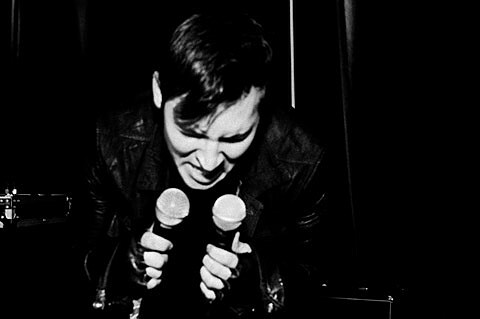 Noise (and increasingly techno) power-house Prurient will be playing a show with industrial electro pop duo Azar Swan, husband and wife post-industrialists Clay Rendering and DJ Becka Diamond in NYC at Saint Vitus on January 24, rolling in the new year in raucous fashion. If you’ve never seen Prurient live, pro tip: don’t forget your earplugs. Tickets are not on sale yet, but you can check Ticketfly for updates. Show flyer below. At the moment it looks like a one-off for Prurient before he heads out as a support act on Godflesh‘s postponed but now rescheduled tour. He doesn’t open the NYC date happening on 4/10 at Irving Plaza, American Sharks do. Tickets for the NYC date are still available. Meanwhile, Clay Rendering just performed at Nothing Changes last week (12/11), and on that date Prurient provided a DJ set. In other Prurient news, props are due for having one of the 100 best songs of the year, as determined by Pitchfork. He also just released a limited seven inch, Washed Against the Rocks, on Handmade Birds.